After a religious experience in his childhood, author David Billings was inspired to investigate the nature of economic growth and the unconventional occurrence of “getting poorer [even] when the social record tells us [that] we are getting richer.” With this comes his growing theory, considerably a new paradigm along with capitalism and socialism, that of “economic actualism.” In this debut publication, “Introducing Economic Actualism” (published by AuthorHouse) addresses long-standing and extensively studied economic dilemmas using a fresh theory that allows the application of a wider understanding to economic situations. Billings considers this book as the first to: explain the logic behind the creation of economic bubbles as a combination of duress, ineffectiveness and inversion; systematically explore the thesis that human society is the confusion of nominal and actual wealth; describe duress as the primary source of economic uncertainty; systematically acknowledge the role of communication in reforming economic bubbles and the challenges which idolatry poses to this process; introduce the psychological stresses of economic participation; and, explain the existential confusion of the left-right political paradigm. 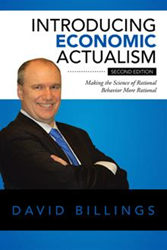 With the use of economic actualism, the author gives answers to questions such as: how to reduce damage both to and from the economy, how to find actual—rather than nominal—wealth, and how the economy can “drive us all crazy.” Billings furthermore offers readers the optimism of achieving the ability to succeed over economic trials. Our economic theories don’t work anymore. Perhaps, they never did. Capitalism, socialism and communism all seem outdated. Economic actualism has been boiled down the study of how nominal and actual economic reality differ into three main branches of study: the uncertainty which is created by the act of economic measurement, the manners by which nominal and actual economic data are certain to diverge, and the social feedback systems which help to keep the first two principles under control. At the present time in North American society, our neglect of all three of these principles is combining to mechanically subvert the quality of our society.